Why join CS at Grinnell? You can also read more about our tenure-track position and some recent questions and answers about that position. At first glance, undergraduate curricula and departments may seem similar. Everyone teaches some kind of data structures and algorithms courses. Everyone has some required systems courses. Many require an upper-level theory of computation course. In those ways, Grinnell is much like other departments. But some characteristics of the curriculum and the College make us special. A multi-paradigm introductory sequence. We believe students learn CS best when they are exposed to a variety of approaches to problem solving. We emphasize functional programming in the first course, imperative in the second, and object-oriented in the third. As you might expect, each class develops students' skills in algorithmic thinking. Each class also focuses on a particular problem domain. This year, the first course considers data science in the fall and digital humanities in the spring. The second course emphasis robotics, while the third course draws on a variety of domains. An active peer-support community. Nearly every CS course has an embedded mentor, a student who has previously taken the course and is available during every class meeting to assist with questions during labs or discussion. Each mentor also holds a weekly evening session for additional practice, study. and review of the class material. Our computer labs are also staffed in the evenings with trained tutors available for drop-in questions and homework help for students in the introductory courses. These peer educators are coordinated by a dedicated staff member. The department also has a strong commitment to diversifying the discipline, which is reflected not only in the issues discussed above, but also in a number of other departmental initiatives. Many efforts focus on developing a sense of community in the department, including peer mentoring programs, weekly lunchtime discussion groups, and evening study breaks. Our efforts have been successful. For example, over 30% of our majors are women, above the national averages. The CS department is also active in institution-wide diversity efforts, such as the Grinnell Science Project (GSP), which has been honored with the Presidential Award for Excellence in Science, Mathematics and Engineering Mentoring for more than twenty years of successful efforts to increase the number of students from underrepresented groups who earn degrees in the sciences. Two members of the department have served as leaders of GSP in recent years. We are also active in the the Liberal Arts Colleges Association for Faculty Inclusion (LACAFI), an organization co-founded by Grinnell that aims to assist in the recruitment and appointment of faculty committed to diversity in the sciences. We particularly hope that candidates who share our commitment to diversity will apply. Grinnell, like most comparable institutions, expects that its faculty are strong teachers and strong scholars. And like most comparable institutions, we provide faculty with startup funds, annual research grants with support for travel to conferences. But there a few things that set Grinnell apart. Faculty research labs. When we moved into our new space in 2007, we made sure that each faculty member had a research lab in addition to an office. Labs can serve as a place for specialized equipment, a place for your research team to work, a place separate from your office to get work done. A rich culture of student-faculty research. Grinnell College seeks to provide every student an opportunity to pursue research and share the product publicly. Grinnell's student-faculty research fund regularly allows interested faculty to work with students each summer while compensating those students appropriately. Faculty also receive stipends for summer work with students. Funds are usually available for at least four students per faculty member. Students regularly present their work at regional, national, and international peer-reviewed conferences. Broader connections. 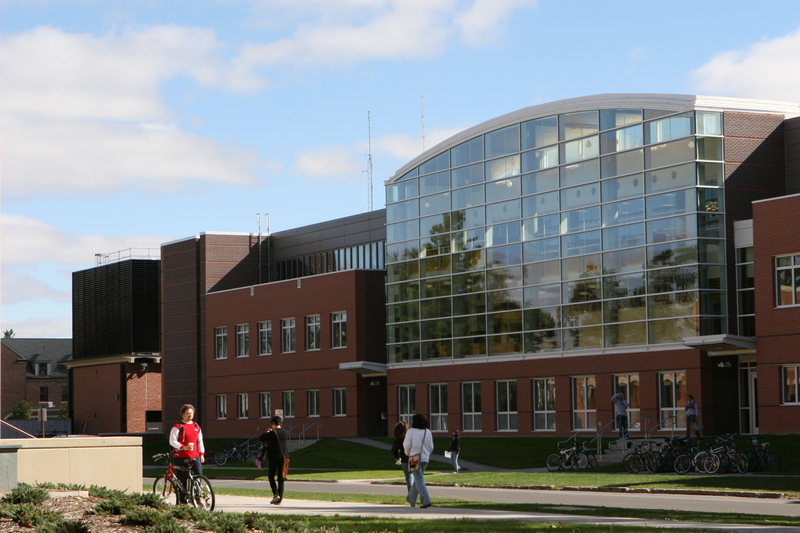 Grinnell is one of fifteen liberal arts colleges that belong to the Computing Research Association (CRA). Tenured faculty that support student research opportunities, whether through summer projects or in-depth projects embedded within an upper-level course are eligible for a year-long sabbatical leave after six years (twelve semesters) of teaching, or a sequence of semester-long leaves after three years (six semesters) of teaching. You may also find it useful to read our statement on expectations for scholarship. While many people separate teaching and scholarship, we often find ways to integrate the two. Many of us have student co-authors on research papers (typically as an outcome of summer research projects). We also leave room in the curriculum for courses that tie closely to our areas of research, such as computer vision and evolutionary algorithms. In addition, several faculty members in the department contribute to the scholarly literature in computer science education. We work hard to hire faculty we think will do well at Grinnell. We work as hard to make sure those faculty will succeed. In addition to the support for teaching and scholarship mentioned above, Grinnell provides a wide variety of resources, from opportunities for mentoring to an active early career faculty group which provides both social and professional support for such faculty. Grinnell has a strong commitment to social justice, revealed, in part, by our need-blind admissions process. We do not consider ability to pay in making admissions decisions, and we meet the full demonstrated financial need (at least according to government calculations) of students we accept. 87% of first-year students receive financial aid, with an average financial aid package of over $45,000 to students demonstrating need. In an era in which student debt is a mounting problem, Grinnell students in the class of 2018 graduated with an average debt of about $19,000. several extra-curricular activities help build a sense of community among computing students.